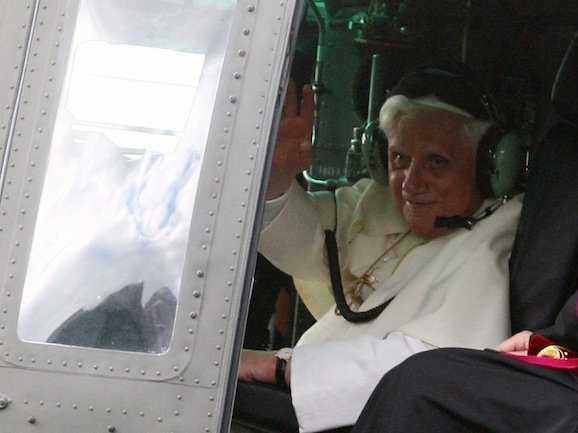 Did you know that Pope Benedict XVI is a chopper pilot? Pope Benedict XVI has a pilot’s license for the papal helicopter and likes to fly from the Vatican to the papal summer residence, Castel Gandolfo, but the pope does not have a driver’s license as he never learned to drive a car. Apparently, Pope Benedict had never saw the need to learn how to drive as throughout his life, he could always get to where he was going though other methods – like flying the papal helicopter or presumably riding in the back of the popemobile in latter years. A dramatic helicopter crash was caught on video during the filming of the Korean version of the hit British TV show “Top Gear” as reported by several British papers like the Guardian and The Independent along with GrindTV which picked up the video from Top Gear’s YouTube channel. In the video, “Top Gear Korea” presenter Kim Jin Pyo was racing an AH1 Cobra helicopter while driving a Corvette ZR1. At around the one minute mark, the helicopter does a loop in the air with the pilot apparently losing control and coming down hard on the ground – kicking up a huge cloud of dust. Apparently, no one was seriously hurt, but we can probably assume that the helicopter will be grounded for awhile or perhaps permanently. David Cenciotti, the blogger behind the Aviationist, has brought our attention to the AgustaWestland AW101 – one of the major toys in the latest James Bond movie, Skyfall. The helicopter, known as “Merlin” in aviation circles, is used by Bond’s enemy but its also being used by the militaries of several countries around the world, including the UK. In addition, the movie also featured an AgustaWestland AW159 Wildcat which has been ordered for the British Army and Royal Navy. According to Wikipedia, the AgustaWestland AW101’s origins date back to 1977 when the UK Ministry of Defence issued a requirement for an anti-submarine warfare (ASW) helicopter to replace the Royal Navy’s Westland Sea Kings. The helicopter was then jointly developed by Westland Helicopters in the UK and Agusta in Italy as well as manufactured in facilities located in Yeovil (south Somerset) and Vergiate (Italy). The AW101 ultimately replaced many older helicopters like the Sikorsky S-61 for medium-sized transport and anti-submarine warfare roles. The AgustaWestland AW159’s origins date back to 2002 and its an improved version of the Westland Super Lynx military helicopter. Its intended roles include battlefield utility, search and rescue and anti-surface warfare. Real planes use only a single stick to fly. This is why bulldozers & helicopters — in that order — need two.